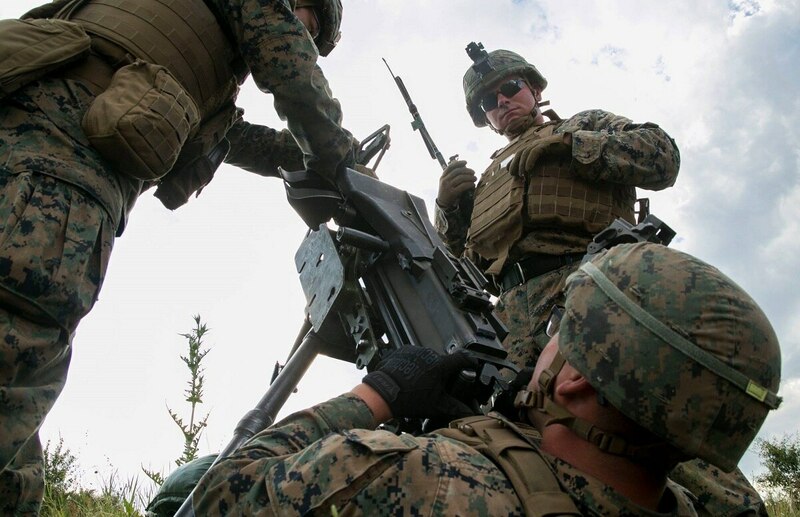 The Marine Corps is in Bulgaria practicing high-angle fire with a 40 mm grenade launching machine gun known as the Mk-19 — it’s a tactic they say isn’t trained very often. The tactic could be beneficial in striking down infantry troops behind walls or protection, or taking out advancing Russian armor and light-skinned vehicles. It is another example of the Corps amid a training shift focused on rising near-peer competitors like Russia and China as the force returns to the fundamentals of infantry tactics to maintain skills for more traditional warfare. Marine 0331s, or machine gunners, who spoke to Marine Corps Times say high-angle fire from the Mk-19 would be beneficial for striking targets in defilade or taking out some armored vehicles. Marines are training in Bulgaria honing sniper skills and anti-armor tactics at the Novo Selo training area located not far from the Black Sea. The sprawling Bulgarian military base is known to host NATO partners for reconnaissance and tank maneuvers.